The modelling challenge is an annual occurrence at ExpoNG, for 2009 it was named the Dave Brewer Memorial Challenge in tribute to the late chairman of the G&DNGRS. The theme of the challenge was to create a servicing facility for locos or rolling stock with a maximum size of 60 scale feet in each direction. As you might expect from a fairly open brief, the diversity of the entries was wide, both in scale and concept. After not quite getting there last year, I was determined to complete my own entry to the competition and finally managed it – albeit two days before the show. So, a summary of the entrants and the winner! 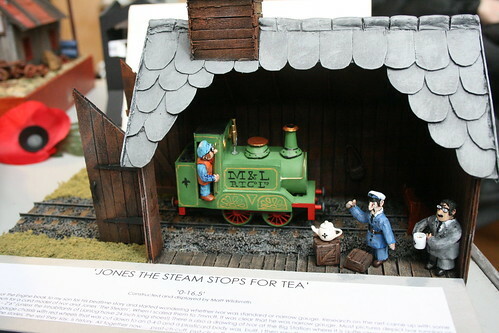 A charming entry in O16.5, based around a carboard kit of the famous Ivor the Engine. Matt conducted extensive research (i.e. he watched some cartoons) to determine the correct gauge for Ivor and settled on roughly 2’4″. The cardboard look of the loco is carried through to the shed and surroundings and the whole thing works together very well. 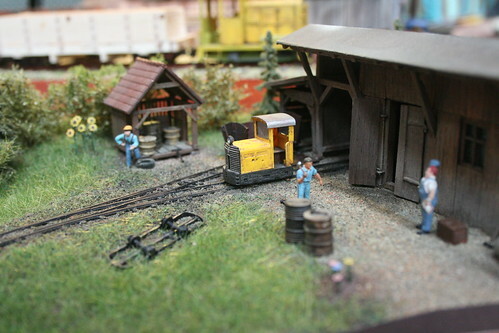 A tiny, exquisite diorama in HOf – that is 3.5mm scale and 6.7mm gauge track. Despite the small size it is crammed with life and detail and was perhaps the most conventional of all the entries – it could quite easily have been a little slice of something much bigger. 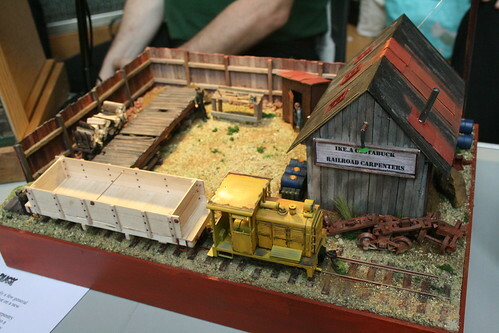 An On30 wagon works showing a brilliant contrast between brand new and heavily weathered wood. The majority of the rolling stock and structures on the scene were constructed from wooden coffee stirrers supplied by Ikea, Costa Coffee and Starbucks (hence the name) and has inspired Martin to plan a full On30 layout as a follow-up. A recent theme to Gn15 modelling has been the development of the “Emmet” style, inspired by the artist who created a series of light-hearted cartoons and the famous railway the 1951 Festival of Britain. 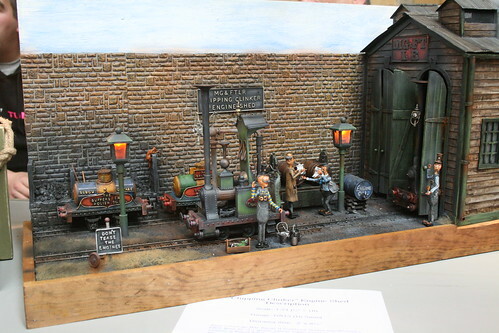 Mark Goodwin has used the Smallbrook Studios resin kits to create an eccentric locomotive works – of particular note are the proportions of the loco shed doors which match the tall, thin engines perfectly. My entry to the challenge is an attempt to depict the little people of 4mm scale creating their own OO9 engine out of an “unsuitable” German N gauge loco with the addition of various bought-in components. It contains some terrible puns. I’ll blog about it in more detail soon! Finally, the winner! 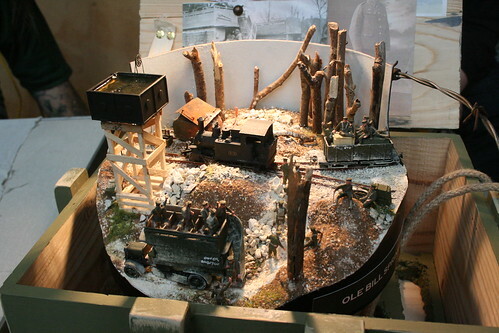 Ole Bill Springs is a detailed scene from a World War I trench railway in OO9, and has a personal connection for Robin Winter as his grandfather fought there and a photograph inspired the composition. Despite the tiny size, the loco is able to move and the turnout can be operated. The circular shape and reproduction ammo crate it sits in only add to the character. Well done Robin! 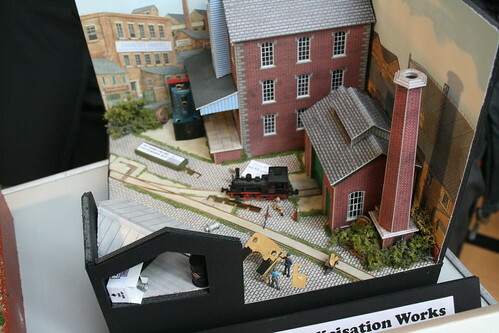 This entry was posted in 009, exhibition, expong, Gn15, model railways, narrow gauge, O16.5, photos. Bookmark the permalink. I love the Emmett, too, but my favourite has to be Ivor the engine…lovely.